From NextSTL: The City of St. Louis Planning Commission will decide on the adoption of the Downtown St. Louis Multimodal Plan at the planning commission meeting on December 5, 2018. This exciting plan is a blueprint for how to increase transportation options in Downtown St. Louis. Recommendations include both long- and short-term project ideas, as well as policy recommendations for how the City of St. Louis can foster a more vibrant Downtown where walking, biking and public transit are safe and accessible modes of transportation. 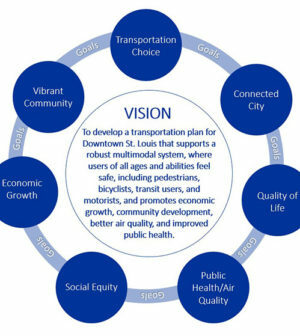 The vision for the Downtown Multimodal Study is a plan for Downtown St. Louis that supports a robust multimodal system where users of all ages and abilities feel safe, including pedestrians, bicyclists, transit users, and motorists, and promotes economic growth, community development, better air quality and improved public health. The plan outlines the visioning and planning process and includes recommendations and implementation strategies. Moving forward, the Downtown Multimodal Plan should serve as the vision for transportation improvements in Downtown St. Louis and guide infrastructure decisions and investments. The project started in the spring of 2017 and culminated in September 2018, and included three stakeholder engagement weeks, as well as coordination with many ongoing plans, and agency coordination with over 100 individuals representing nearly 75 agencies from around the St. Louis region. The Downtown Multimodal Study is one component of a three-part Congestion Mitigation Air Quality (CMAQ Grant) project of the City of St. Louis. CMAQ funding is available to projects located in non-attainment air quality areas that help minimize congestion and improve air quality. The project also includes Traffic Information Center Staffing as well as further system buildout for various traffic related devices and infrastructure in the Downtown Core and throughout St. Louis City. The Downtown Multimodal Study component includes a signal timing plan in the Downtown St. Louis core, developing recommendations for a robust multimodal transportation network as well as a Protected Bike Network Plan.